In the face of 4 straight losses, the Flyers hope to right the ship with the return of Sean Couturier tonight. What's going on with Jake Voracek this season? Whatever it is, he doesn't resemble the wily Czech forward we've come to know and love. Through 10 games, the all-star winger only has 3 points off 3 assist and no goals. This is a far cry from last year when he started the first 10 games with 15 points. But we're firm believers here at the Beat that Jake is gonna be just fine. Not good. Early in the second period of Saturday night's contest between the Flyers and New York Rangers, play had to be stopped after Flyers forward Michael Raffl collapsed on the bench (video below). Raffl would need assistance getting to the locker room after the play stoppage. Raffl had collided with Rangers forward Jarret Stoll shortly before, taking an elbow to the face. Ron Hextall continued to make moves today, one day after the NHL draft that saw the Flyers pick up Russian defenseman Ivan Provorov with the 7th overall pick. The Flyers will swap underperforming defenseman Nick Grossmann and the remainder of Chris Pronger's contract for Arizona Coyotes center Sam Gagner and a conditional 2016 or 2017 draft pick. 22 year-old Switzerland native Christian Marti stands 6'3" 210 lbs. and is now a member of the Philadelphia Flyers after being signed to an entry level contract yesterday. Marti has spent the last 2 seasons playing for Geneve-Servette HC of the Swiss National League. In 82 games he's posted 20 points off 5 goals and 15 assists. Per Eliteprospects.com Marti "Has untapped offensive abilities and owns a booming shot from the point, which makes him a reliable option for a power play unit." Sounds like a prospect with a good bit of promise that needs some development. Very little is known about Marti though (don't pretend you're an avid Swiss hockey fan), so we'll see how he does when camp opens up. I'd expect to see him open the season on the Lehigh Valley Phantoms roster. It was a wild ending at the Wells Fargo Center tonight. In a game that was meaningless for the Flyers, but of the utmost importance for the New York Islanders, the orange and black surrendered a 4-1 lead only to win it on a Brayden Schenn goal on a zone entry with just 2 seconds left. As most of you are aware, the last time the Pittsburgh Penguins went to battle with our Philadelphia Flyers and emerged victorious was October 17, 2013. I thought it would be fun to take a look at the way life was back then, a whole 536 days ago, compared to how they are now. In traditional Flyers fashion, they faced off tonight against a team that was much better than them and won. That team tonight was the Chicago Blackhawks, the 4th best team in the Western Conference, who fell to the Flyers 4-1. Imagine what the Flyers record would look like right now if they could only play top-tier teams every game. The Flyers current playoff chances, already bleak, are now on life support after a 2-1 loss in Ottawa tonight. 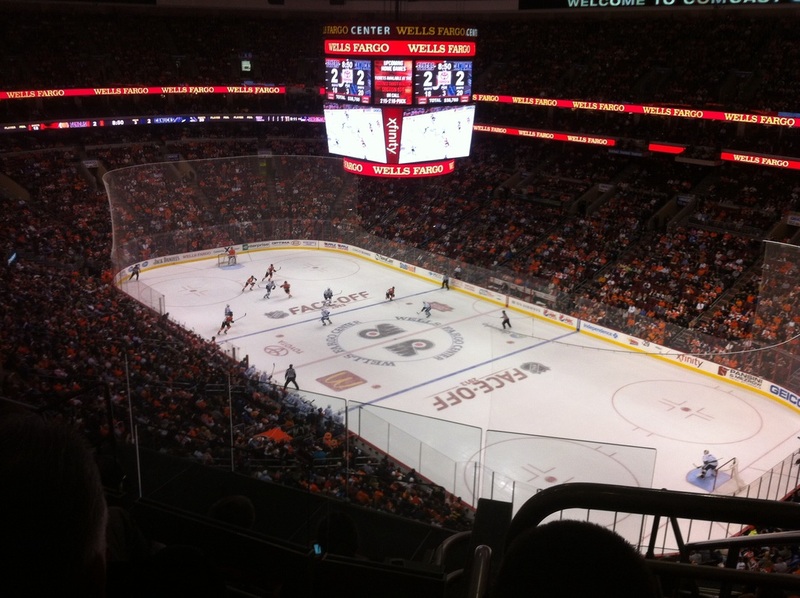 Ray Emery performed well, but the Flyers offense couldn't give him any support and the team lost in a shootout. I could probably copy and past that first sentence for the majority of Flyers game this season. Steve Mason posted a shutout tonight on 35 saves. The Flyers still lost though, in a shootout that saw T.J. Oshie and Vladimir Tarasenko score for the Blues but no one score for the Flyers. Mason now has 3 shutouts this season, 2 of them being losses. The harsh words he had about the team's effort after Tuesday's loss rang true again tonight. Mason moved mountains to give the Flyers a chance for a much needed win, but received no offensive support in a 1-0 shootout loss.